Keeping in step with both vehicle and gear trends, Yakima Racks, an industry leader in vehicle racks and cargo solutions for almost 40 years, is introducing its most rugged collection yet in 2019. Truck_hero_small.jpgCentral to its 2019 line is the new HD Truck Rack Collection. Built for the back roads and tested to Yakima’s new Off-Road Rated standards, the heavy-duty rack collection includes three different systems: OverHaul HD, OutPost HD and BedRock HD. Each easily converts almost any truck into a gear-hauling machine. Also debuting in 2019 are the SkyRise HD, the new ruggedized version of Yakima’s popular rooftop tent; the HangOver, the brand’s first vertical bike rack, the EasyRider, a versatile lightweight trailer that carries up to 500 lbs of gear, and the SkinnyWarrior, a new size of the best-selling cargo basket designed to create more roof rack space to carry other gear. Get ready to push the limits of the “work hard, play hard” mantra. Yakima’s new HD Truck Collection represents the first set of products to be awarded Yakima’s new Off-Road Rated testing standard designation. Built with maximum functionality and versatility in mind, the three different rack systems – OverHaul HD, OutPost HD and BedRock HD – include adjustable heights, tonneau cover compatibility and a new, widely compatible heavy-duty crossbar (sold separately). For weekend adventures and hardworking weekdays, the new OverHaul HD adjustable truck rack brings best-in-class payload and unmatched versatility. Leveraging Yakima’s new HD Bars for a 500 lb. on-road carrying capacity and paired with 300 lb. Off-Road rating, the OverHaul HD is the ideal foundation for heavy loads. Multiple tie-down points and the ability to fit most truck beds with the heavy duty BedGrip™ clamp design—including select tonneau covers—make this an ultra-functional rack that works and plays hard. The crossbar height can easily be adjusted from 19-30 inches: way up for long loads to go over the cab; down low to get the rack and load down out of the wind; and an infinite number of positions in between. Introducing the HangOver, the first vertical bike rack to meet the Yakima’s demanding testing standards. Tested in the lab and on the road, the HangOver safely hauls up to six mountain bikes to the trailhead. Perfect for group rides, big families and tour operators, the HangOver’s vertical orientation carries more bikes in less space, and its easy-to-operate tilt mechanism makes accessing the tailgate a breeze. Available in four- and six-bike capacities, the HangOver securely holds any bike with a suspension fork. Soft padding protects the fork’s finish, and rotating wheel cups accommodate bikes with a variety of wheelbases. The HitchLock secures the rack to the vehicle and, of course, Yakima’s signature bottle opener is built in. The SkyRise HD is the hub of the ultimate mobile base camp, and with a roomier geometry, improved four-season weather protection and enhanced durability, the newest version of Yakima’s popular rooftop tent brings more of everything for 2019. The tent’s geometry has been revised to deliver more usable space, plus expanded windows, doors, and skylights that provide grander views and better ventilation. The tent body is made from a thicker 600D Ripstop Poly fabric and an added layer of 3000mm waterproof PU coating. The t rainfly is 210D Ripstop Poly with a 3000mm PU coating – providing four-season weather protection. A burlier floor material ups the tent’s durability. Floor-mounted d-rings and guy points make it easier to hang gear and guy out the tent for a secure pitch in windy conditions, and a new ladder design makes it easier to adjust for various vehicle and ground heights. 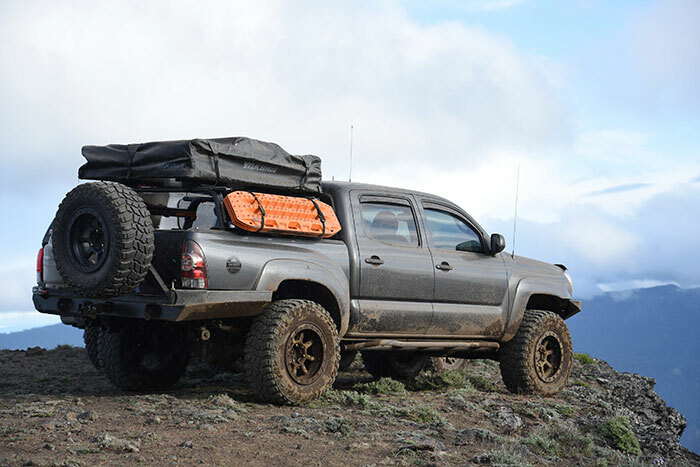 Adventurers can customize the SkyRise HD with Yakima’s collection of rooftop tent accessories. Introducing Yakima’s new master hauler: the EasyRider multi-sport trailer. With two levels and 500 lbs. of carrying capacity, the EasyRider hauls up to three fishing kayaks or recreational kayaks up top, with room underneath for coolers and gear. Together with the new BigCatch – the first universal kayak saddle strong enough to handle heavy fishing kayaks and sit-on-tops – it’s the complete package for the kayak angler on the move, and it’s also the perfect base for the SkyRise rooftop tent, creating an instant travel trailer. EasyRider accessories include the SpareTire, which easily attaches to the trailer’s frame so the spare is always there if needed ($199), and the TentKit, which creates a level platform for the SkyRise rooftop tent ($199). Accessories include the SkinnyWarrior Extension ($119) for wrangling even more gear with 16” of additional space, and the StretchNet Skinny ($39), which is designed for the SkinnyWarrior with or without extension and keeps loose gear safe and secure, even on bumpy back roads. Yakima Products, Inc. is a world leader in vehicle racks and cargo solutions for a variety of consumers, from outdoor enthusiasts to car aficionados. The company offers variety of cargo management products, including racks for bikes, boats, ski equipment and other gear, cargo boxes and bags, roof top tents and awnings, and high performance multi-sport trailers. Yakima Products, Inc. is headquartered in Lake Oswego, Oregon.